Add a little individuallity to the 3rd brake light of your Miata. year outdoor durable cast chrome vinyl. The dark area in the group photo represents the 3rd brake light. These decals are easy to apply and look great. peel decal backing and carefully apply it to the 3rd brake light. Carefully remove the application tape and you're done. Page down... You will see a group photo of ALL the decals that are available. 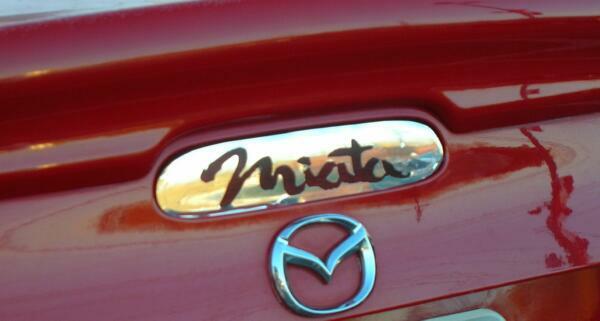 The Miata decals are available for all Miata's (1990 - 2005).....Specify style at checkout. 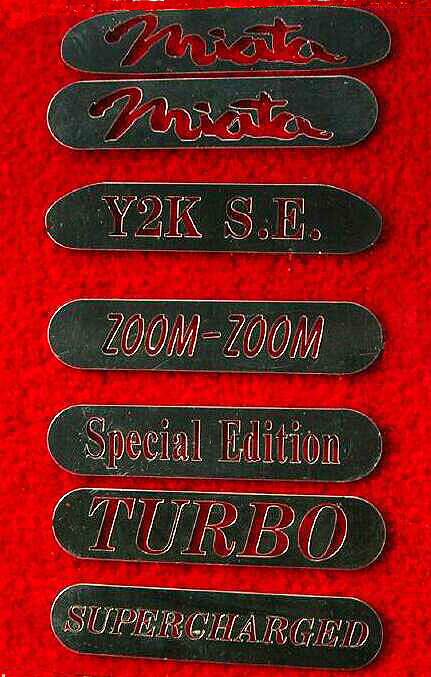 The Y2K S.E. decal is available only for Gen.2 Miata's (1998 - 2005). All other decals are available only for the Gen.1 Miata's (1990 - 1997). ZOOM ZOOM Decals are NO Longer Available. Price: $4.45 Each + $.55 Shipping.